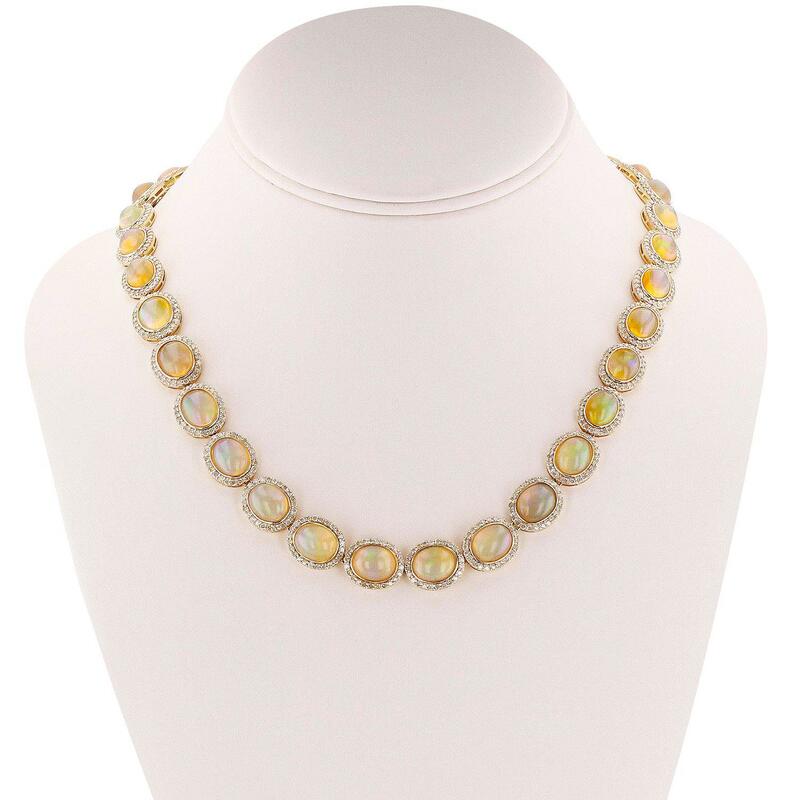 One electronically tested 14KT yellow gold ladies cast & assembled opal and diamond necklace. Condition is new, good workmanship. Eighteen inch length necklace features a slightly graduating flexible opal and diamond bezel ribbon, terminating in a concealed clasp with twin safeties. Bright polish finish with rhodium accents. Trademark is Orianne. Identified with markings of "14K". Thirty-three jelly opals that are cut in an oval shaped cabochon and are bezel set, measuring 9.00mm long x 7.00mm wide, and 4.30mm thick and the approximate weight is 46.37 carats. The opals have a somewhat bright, orange-green play of color (fire) in a flashfire pattern; a high dome; a good cut; slightly included; slight variation in base in their brightness and pattern; and are slightly directional. Measurements are an average for the group. Graded in the setting. Seven hundred ninety-two prong set round brilliant cut diamonds approximate total weight of 792 Stones = 8.67ct.